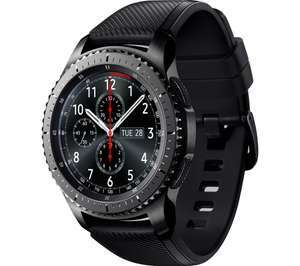 Save £120 on the Samsung Gear S3 watches at Carphone Warehouse, they seem to be £299 everywhere else. So seems like a good deal - just over £200 for a smart watch. £50 more for the 42mm - you get a newer model plus a free charger. Longer battery life is a big selling point for some, but i charge my S3 nightly. I don't no what people do with there watches to be going on about battery life, I get 3/4days from the gear3. Its a great watch at a great price. Heat all day long at this price. If you believe that the duo charger on offer with the new model is worth £89, then this deal is more expensive than the newer model (If you also wanted an expensive phone/watch charger). Trade in available against the new galaxy watch too. 50 off with gear fit 2 trade in. Cant wait to get my 46mm Gear watch. Even though it was £45 more with £25 trade in, its water proof, better bttery and free dual charger which will be great for my s9+ and watch on my bedside table. Heat for this too though, very good price. This will fall in price the closer we get to the release of the new watch. I'd wait until the new one is released to move on this. I'd argue that what you're suggesting is a lot of hassle and potential impact on your credit rating to achieve a £50 saving on a £300 watch. I'm torn by this. On the one hand, the Gear S3 is very similar looking to the new Galaxy watch and is £80 cheaper (using this deal). One the other hand, a wireless duo charger would be useful, as would better battery etc etc. I'm not sure that I'd normally pay £89 for a wireless charger though. really wish they done the rose gold in the bigger version, I like the look of the small one and being a girl it would suit me better, but that difference in battery life for such a small difference in price is killing me. I'll still endup pre ordering the rose gold model on payday though. charging it a little more often than I would with a bigger battery version isnt a deal breaker for me, just a little annoying. Cant wait to get my 46mm Gear watch. Even though it was £45 more with £25 t …Cant wait to get my 46mm Gear watch. Even though it was £45 more with £25 trade in, its water proof, better bttery and free dual charger which will be great for my s9+ and watch on my bedside table. Heat for this too though, very good price. You mean the Galaxy Watch ? Has exactly the same water resistance as the Gear S3 (5 ATM), it's not waterproof, it's splashproof. Battery has increased from 4 to 7 days, but I bet real world you'll barely see half a day difference between the two when you start using it. Charger works for you with the S9+ though. Samsung had 2 years to deliver a stunning successor, it's barely tinkered with it, utter disappointment. You mean the Galaxy Watch ? Has exactly the same water resistance as the …You mean the Galaxy Watch ? Has exactly the same water resistance as the Gear S3 (5 ATM), it's not waterproof, it's splashproof. Battery has increased from 4 to 7 days, but I bet real world you'll barely see half a day difference between the two when you start using it. Charger works for you with the S9+ though.Samsung had 2 years to deliver a stunning successor, it's barely tinkered with it, utter disappointment. Oh no way I didn't realise that the s3 was shower proof and can wear it swimming as well otherwise I would have seriously thought about getting that instead of the new one. But the free charger is nine looking although I doubt it's worth the £90. Oh no way I didn't realise that the s3 was shower proof and can wear it …Oh no way I didn't realise that the s3 was shower proof and can wear it swimming as well otherwise I would have seriously thought about getting that instead of the new one. But the free charger is nine looking although I doubt it's worth the £90. So they both the same but can only wear one for swimming? So how can they be the same? I want mine for swimming that's why I went with the galaxy watch plus the free charger. So they both the same but can only wear one for swimming? So how can they …So they both the same but can only wear one for swimming? So how can they be the same? I want mine for swimming that's why I went with the galaxy watch plus the free charger. So can you swim in the frontier or not? I bought my Gear 3 Frontier for £192 a month or so ago from eglobal central UK. Watch came without a problem and very happy with it. Pretty sure they still have it at that price plus the classic is a little cheaper than that I think from memory. Galaxy Watch has a water resistance rating of 50 meters under the ISO standard 22810:2010. It is not suitable for diving or high-pressure water activities. If the device or your hands are wet, they must be dried thoroughly prior to handling. It's 5 ATM which applies to water pressure. Lol at people that keep spouting that. 50m water resistance isn't a neglibible difference, even not considering all the other improvements. Perhaps some don't care but it's a big deal. 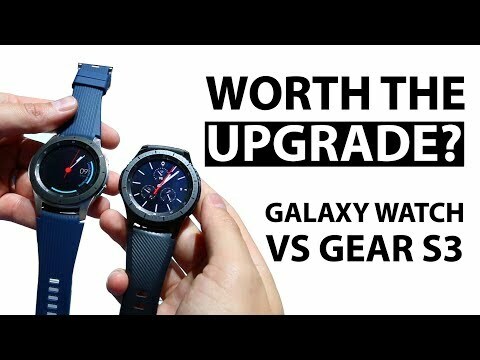 The Gear S3 isn't rated 5ATM, and shouldn't be used swimming - I know some have successfully, while other's watches have broken doing that apparently. The Galaxy Watch also obviously has proper swim tracking etc. And the 42mm version is obviously a fair bit smaller and more suitable for sports. The Galaxy Watch is what I was waiting for. Glad I didn't get the S3. Also, the Galaxy Watch deal is great, expect the deal to be worse after release - it was for the S3. Don't know why people are expecting a price fall when the S3 barely did. And that the duo charger is easily worth 40 quid, perhaps 50 if you want it. So if you count that, with the £25 trade in - both offers that will likely get removed (certainly the free charger), it's around £200 for the Galaxy Watch. I bought the S3 Classic for £200 brand new from Amazon and that was before the new Galaxy watch was on the scene. I don't see why people are paying more than what I paid for it especially as the new model is out. Think this watch should be sub £200 at the most. You're wrong. Galaxy watch has swimming as one of its sport modes - check for yourself. You're wrong. Galaxy watch has swimming as one of its sport modes - check …You're wrong. Galaxy watch has swimming as one of its sport modes - check for yourself. Did you read my comment? I've stated the two different marketing tools, splash v swim. Yet both are IP68 rated. Why don't you go check why 2 watches with the same IP rating have different stated water resistances? Did you read my comment? I've stated the two different marketing tools, …Did you read my comment? I've stated the two different marketing tools, splash v swim. Yet both are IP68 rated.Why don't you go check why 2 watches with the same IP rating have different stated water resistances? Probably because it's an imperfect categorisation system, with each IP rating expressed to represent a narrow range of resistances. It's possible to exist at different points within that range of categorisation. If two boxers were within the same weight class category, it's still possible (and likely) for one to weigh more than the other. Is the frontier LTE? Ime looking for a galaxy watch that is LTE. Deal posting newbie! This is JillC85 first deal post. Help out by leaving a posting tip or just to show your appreciation for their contribution.